Here’s a secret everyone knows: this Trump/Russia/Treason thing is nonsense. The Russians will do whatever they can to destabilize our country, and have been trying since long before Teddy Kennedy actually did collude with the Reds against Ronald Reagan. Of course they want to destabilize us. They’re Russians. But now we are getting a ration of insanity about it from a bunch of people who only discovered that Ivan is bad news about the same time Stumbles McMyTurn lost. When they are yelling that Donald Trump’s press conference was (Pearl Harbor + 9/11) x 1,000,000, forget about raising any legit grievances with Trump’s performance. We’re not playing their game. Why bother with reason? It’s kind of hard to have a rational discussion with people screaming “traitor” and “treason,” especially when they have been screaming “traitor” and “treason” for the last 18 months and we’ve seen no traitoring or treasoning. But the facts don’t deter them. Trump’s clearly Putin’s puppet because he just pounded on NATO to carry its own ruck and increase defense spending to counter…wait for it…Russia. Apparently strengthening NATO is playing right into Putin’s cunning claws. And giving grief to the krauts for doing a gas pipeline deal with the Bear…that was horrible too, for some reason. Giving lethal aid to Ukraine, cruise missiling Russia’s pal Assad, and whacking 200 Russian mercs in Syria…none of that matters because none of it supports the official narrative. Trump’s actions are indisputably exponentially harsher on Russia than anything Obama did, but citing that evidence and those facts is now itself evidence of collusion. My favorite part of the day is going on social media and having froth-lipped adherents of the party that eagerly signed on with the KGB’s 1980s nuclear freeze campaign telling me, a guy who was then serving in Germany on the west side of the Wall waiting for the Reds to invade, that I’m a traitor. This argument is not compelling. All this kind of babble does is annoy me and millions of other people who refuse to freak out at the behest of establishment hacks eager to regain their lost power. It’s a power play. Certainly, there are people spouting this stuff who are stupid enough to believe it. After all, idiots are a key Democrat constituency. My congressdork, Ted Lieu, probably believes everything he breathlessly tweets, but in his defense he’s incredibly foolish. Yet many of these weasels know full well that what they are saying is ridiculous. They don’t care. Let’s assume Donald Trump is a secret Putin pawn – is there anyone who can count to 20 with his shoes on who thinks Mike Pompeo, John Bolton, or Mad Dog Mattis would tolerate that? No, there isn’t. Well, Ted Lieu probably does, but he’s the kind of guy who keeps magic beans sellers in business. Any legit criticism of Trump’s policies is swamped by the insanity. But that’s part of the plan. They want people so outraged they can’t, or won’t, think. This is a cynical ploy to ramp things up to a fever pitch and panic the weakhearts. They seek to split the GOP between Trump supporters and the Flake Fredocon Faction of simpering sissies so they can retake power. The establishment was always going to dogpile Trump no matter what he did in Europe. That he gave them some ammo with what he concedes was loose talk followed by a walk-back only made their job easier. But the fix was already in. Will it resonate with regular Americans? You know, the ones who aren’t watching MSNBC lunatics shouting that Trump is literally Hitler, just like W, McCain and Romney were literally Hitler? Normals are simply not reading 37-tweet threads explaining how pretty soon Trump’s going to make sure there are spetsnaz troops with AK-47s on every street corner, forcing our country into a Red Dawn scenario where #TheResistance shouts “Avenge me! Avenge me!” and fights back against the invaders, presumably with vicious tweets and gyno-beanies. It will not resonate, any more than the last hundred WORST THING EVERs resonated. And why should it? After years of hearing how Trump is all four Horsemen of the Apocalypse, it’s hard to make him the fifth as well with some new atrocity that, upon sober reflection, is not exactly earth-shakingly atrocious. Why would the establishment believe it had any credibility anyway? As my upcoming book Militant Normals: How Regular Americans Are Rebelling Against the Elite to Reclaim Our Democracy explains, Donald Trump is in office because the establishment failed. And it is probably treason to point this out, because everything is treason now, but Putin was in office for a long time before Trump beat Felonia Milhous von Pantsuit, and the stuff he's done lately pales in comparison to the stuff he did back then. 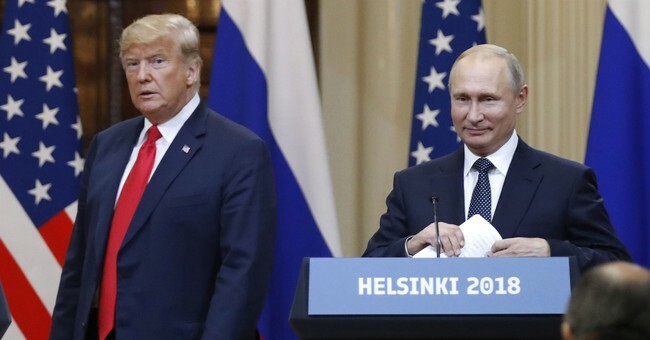 Putin’s a thug and an enemy, but Normal people quite naturally wonder why Trump is solely to blame for the boil Bush II and Obama both let fester. The establishment cries, “Horrors! Trump refuses to uncritically accept the word of the intelligence community.” But isn’t that the same IC that provided the 411 that caused these same screaming weenies to howl “Bush lied, people died!” Just following the narrative will give you whiplash. And isn’t it the same IC whose head honchos have been actively plotting Trump’s overthrow since Hillary sowed what she didn’t reap in Wisconsin? Normal people notice this stuff. Trump needs to do a better job of distinguishing the good, solid people in the IC and FBI from the hacks, corruptocrats, and liberal flunkies infesting them, but then Normal people understand that there are a significant number of hacks, corruptocrats, and liberal flunkies infesting them. The idea that these institutions are beyond criticism is not going to fly, at least not in the flyover states.